Polyester - Clear 7950 3M 7950 | Fabrico, A Division of EIS, Inc.
Facestock is topcoated for improved ink anchorage. Thermal transfer printable. High abrasion and solvent resistance. Good for indoor and outdoor use. High tack adhesive bonds well to low surface energy substrates. 90 lb sheetable lay-flat liner. UL recognized and CSA accepted. Facestock is topcoated for improved ink anchorage. 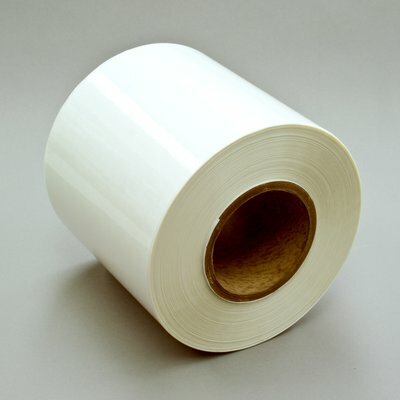 Variable information can be added by the end-user as the material is thermal transfer printable. 3M adhesive 300 bonds well to a wide variety of substrates including metals, high surface energy (HSE) plastics and low surface energy (LSE) plastics. It is ideal for applications requiring high initial adhesion especially to LSE plastic surfaces. Liner provides easy sheet processing and is designed for layflat. The backside of the liner is not printable. UL recognized (File MH11410) and CSA accepted (File 99316). See the UL and CSA listings for details.